The July 2017 issue of OVERDRIVE is now out on stands! The rains are finally here. 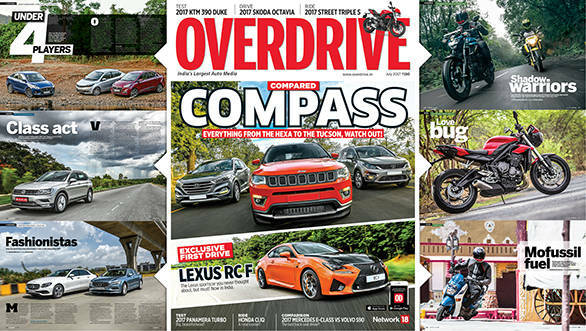 As fresh as the feeling in the rains is, so is the new issue of OVERDRIVE. Grab the cover and what'll instantly catch your attention is the big, bold Jeep Compass, engaged in a slugfest with the big Tata Hexa and the stylish Hyundai Tucson. Rahul tell us who wins. After Rahul was done playing around in the Jeep, we gave him the Jaguar F-Pace Prestige 20d to, well, put it through its paces. Rahul also got to drive one of the most potent 4-door sedans in the world, the Porsche Panamera Turbo. Rohit loves the rains. You see, he likes to relax and unwind, with a nice cuppa piping hot tea and vada pav! So off he went to relax, we mean, experience the BMW 740Li. Rishabh too loves his cosy cup in his armchair with some hot bhajiyas, so we fed him that and put him in the back seat of the Mercedes-Benz E220d LWB. While at it, he also got the stylish S90 to see which one catches the buyer's fancy. Aditya likes everything premium, so he obviously put his hand up when Volkswagen invited us to drive its new premium SUV, the Tiguan. Bob was handed a pretty tough assignment - to choose the best compact sedan in the market. So off he went to compare the Tigor, Xcent and Dzire, all in their new avatars. Shumi was another man on a mission as he donned his riding gear and set about to figure out if the new Yamaha FZ25, with its extra cubes, has the capacity to take on the fun TVS Apache RTR 200 4V. He then packed his kit and flew to Jaipur to ride the new Honda Cliq. Rishabh also loves fast motorcycles, but his pocket isn't very friendly. So we put him on the new KTM 390 Duke which promises an unmatched price-to-performance ratio. In motorsport, the 24 Hours of Le Mans proved to be the ultimate test of man and machine, and our motorsports guru, Vaishali Dinakaran, brings you all the action that unfolded at the mega event. All this and a lot more await you in the July issue of OVERDRIVE. Grab your copy and, oh wait, the chai and samosas too!